Clear Blue Sky: Lesson 1: Futsal vs Football vs American Football? Lesson 1: Futsal vs Football vs American Football? This post is highly educational. If you find this post boring in anyway, you're not into ball games. Ok let's get into this. The simplest way to differentiate each of these games are the playing area, futsal in a court, football on the pitch, and American football on an even bigger field. On the left where you see numbering on the field is the American football field, those number shows how near you are to scoring points. 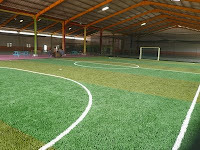 On your right, it's the futsal turf court. Ok, you might be asking what's a turf court? Turf courts are those courts that are carpetted with artificial grass/syntetic grass like the one you see here. There are other kind of courts such as syntetic surface (mainly used for world class tourneys), concrete and parquet floor. Do you still need me to show you football pitch? Football pitch are those you see in Barclay's Premier League, Spanish La Liga, German BundesLiga, Italian Serie A, French Ligue 1 and Liga Malaysia. And to save you the trouble of searching, here you go, the pitch on your right. Both American football and football are played 11 players a side while futsal is only played with 5 players a side. Though the numbers can be different when you're playing unofficially. It's all up to your creative mind and there are multitude variance of the sports. During my primary school years, me and my friends played football only on half of the pitch due to insufficient number of players we have. We'll get ourselves into a group of defenders and offensive members. We'll keep defending/attacking the goal depending on which side we're on and we'll get a quick football game. That's all for lesson 1, have fun getting into the games.